Can Coulthard really be a champion? A win, two second places and a third - all things considered it's not been a bad start for David Coulthard in 2001. Joint leadership of the World Championship after the fourth of the 17 rounds, and 22 points more than his team-mate Mika Hakkinen, left him feeling a warm glow after Imola as he faced his best-ever chance of succeeding Jackie Stewart as Scotland's first World Champion since 1973. But does DC really have what it takes to put it all together over a long, long season? The nicest thing about David Coulthard is that fundamentally he has not changed from the fuzzy-haired kid who turned up at Thruxton in 1989, fresh out of karts, and smashed the lap record in his first FF1600 test with David Leslie Racing. The money and the lifestyle have changed, along with the female companions, but the basic character remains unusually intact. Fame, fortune and the success he has achieved at the wheel of the West McLaren Mercedes have not turned his head at all. But some say that nice guys don't win. So far Coulthard's F1 efforts have accrued 10 victories, and more than once he has passed Michael Schumacher in even circumstances. Remember Sepang in 1999? Magny-Cours in 2000? Interlagos this season? But is he tough enough to last a whole season under pressure? When he dedicated his recent victory in the Brazilian GP to his sister Lindsay, whose birthday it was, he might just as well have made it a present to himself to celebrate his 30th birthday the previous week, for it may have been a turning point. When Hakkinen clinched his first World Championship, his first words to his McLaren team-mate as the climbed from their cars in parc ferme at Suzuka in 1998 were: "Next year it's your turn." They were kind words, intended to lift Coulthard's spirits, but they were prophetically inaccurate. It was Hakkinen's turn again in 1999, and despite a strong early push last year, Coulthard's title aspirations had evaporated once again by Monza in September. The predominant perception of the Scot is that there are times when he can be very good, but that he isn't very good often enough to be able to sustain a genuine championship challenge. Remarks such as, "my problem since coming into F1 is that I have always been in championship-winning cars," - intended to illustrate the pressure of expectation upon him - have raised eyebrows and questions. But Coulthard has never lost his faith in himself. "It goes without saying that Brazil was one of David's best drives..."
In 2001 he has been as quick as - quicker than - Hakkinen, without having the sort of ill fortune that saw the Finn stall in Brazil because nobody had remembered to tell him his car had a new clutch, with a different bite point. Coulthard's first four races of a season have yielded a second place behind Schumacher in Melbourne, third place behind both Ferraris in Malaysia, victory ahead of the German in Brazil, and second to Ralf Schumacher at Imola. In Italy he defied his critics by recovering from a shunt on Friday and defending the pole position that he took early in qualifying. 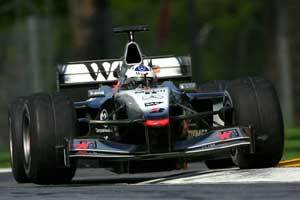 In the final shoot-out, he succeeded in going faster where Hakkinen and Schumacher failed. He was the only man to beat Frentzen's outright qualifying record set four years earlier on slick tires. A telling achievement, perhaps. "I feel that I've got a good opportunity at McLaren," he says, sidestepping the question of whether 2001 could be his last shot at the title. "I don't think I'm here by accident, I think I'm here because I can do the job and who knows what's around the corner? I don't know if it's my last chance but, again, it's an example of people wanting to put your career in a box and close the lid before you're actually at the end of your career." Coulthard has a strong ally in McLaren chief Ron Dennis, even though Dennis has frequently been accused of favoring Hakkinen. He strenuously denies this, and at the beginning of the season stood up for Coulthard as others predicted the big challenge would come again from the Finn. "David will give Mika a very hard time this year," Dennis said in January. "I'm telling you, he is going to be very strong." When it mattered on the Sunday in Brazil, and on the Saturday in Italy, Coulthard proved precisely that. At Interlagos he kept in touch with Montoya and Schumacher in the dry phase of the race, even though he had optimized his car for the rain that he fully anticipated, and deliberately delayed his pit stop just to be sure of the right tire choice. Though Schumacher reclaimed the lead while he was having intermediate tires fitted, he was soon challenging him again. "We just wanted to be absolutely sure what was going to happen with the weather conditions," Coulthard reported. "The team was waiting to tell me the weather reports and came on the radio when I came past the pits saying 'We think it will rain for ten minutes'. So I said 'Let's wait, one lap.' We did - and clearly Michael gained time on that one lap - but when I came out the car was working well and I was able to take advantage of that." His chance came as they lapped a Minardi going past the pits at the end of the 49th lap. Coulthard drew alongside the Ferrari, lost ground as they both braked, but kept his nerve and outfumbled Schumacher by grabbing the inside line and forcing the German to go the long way round the slower car on the outside. It was proof that when the mood is on him he can rise to the occasion and beat the sport's best. If he can keep that mood going, the confidence will remain and he will feed on it. It's too early to say whether this is his last chance, because even a near miss will suggest that he deserves another chance in 2002, but much will depend on the challenge from Ferrari and BMW Williams. "It goes without saying that Brazil was one of David's best drives," Dennis said. "He and his engineers did a great job. His pace in the rain was sensational and his discipline once in the lead was extreme. In the end the points speak for themselves." So Coulthard is driving better than ever. But he says: "The only thing you can carry through from one race to another is confidence." A title challenge? He's been around far too long to think of anything but taking it one race at a time.